I had to pick up Daredevil Volume 2 by Frank Miller & Klaus Janson because it is a direct continuation of the Elektra story arc from Volume 1. It's obvious that this graphic novel is by living legendary writer, Frank Miller, and superstar career inker/colorist, Klaus Janson, considering the title and cover. 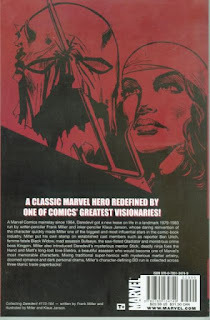 Klaus Janson does the introduction for the book. It was pretty enlightening. I was hoping to get a little insight into what might be in season two of Daredevil on Netflix. The comic starts with a story that relates to Gladiator. If you've read the previous volume the first issue in the comic has a little bit more weight to it. It's a superb transition into Daredevil and the world Miller and Klaus have built. Then Elektra makes an appearance with the Hand in tow. There's some dealings with Kingpin. The classic showdown between Elektra and Bullseye was in this. Some time after that Punisher is introduced. His arc starts but isn't concluded. There's so many superb stories told in the trade. I always love reading these iconic and legendary stories, arcs, fights, face offs, and long time running grudge matches. The first story was a little cheesy but not bad. The Elektra stuff was tantalizing. The Elektra versus Bullseye was underwhelming though. There wasn't much build or reason to it in the comic. It was kind of anticlimactic. I must say the after effects on Matt Murdock is where is weighed most heavily. DD really starts losing his crap for a little while which is a great setup for the Punisher arc since he's in such a bad place. Punisher uses his fragility to his advantage, sways him at times, but in the end really puts things in perspective for ol' hornhead. It's unfortunate you don't get to see the conclusion to their confrontation though but that's just more reason to buy the next volume. It's crazy to think that Frank Miller is the writer and main artist in this comic. That's almost unheard of. You rarely hear of a writer that also illustrates. Miller is hands down one of the greatest comic book scribes of all time. His art is phenomenal as well. He's definitely a top tier artist. I don't know how he doesn't it. Matt Murdock has such a distinct look about him. A lot of the main cast has their own signature look and design. All of the characters clearly differ in appearance. There's so much detail to outfits, hairstyles, the environment, facial hair, clothing, scenery, styles. Facial expressions, movement, and action improve throughout. At first there was not much or it was not that well done but exponentially got better as it went on. Klaus Janson does an amazing job assisting on art with inks and colors. I love this more vibrant, bright, colorful, and warm style of Daredevil art over the dark, depressing, bleak, drab, almost boring and morose DD art tone. Worry not though because it's plenty dark, dreary, and depressing when it needs to be. I was also extremely impressed how the females were portrayed in this book especially considering when it was written. For the most part the women are smart, tough, and not over sexualized. There was only one moment when Elektra was especially sexualized by being in a skimpy outfit but it was in the privacy of her own residence and short lived. It made sense for the moment and time being. At no other time did I feel she or any other lady seem, look, or feel misrepresented. Klaus Janson mentioned in his intro how sophisticated Frank Miller writes and the point they just click as a creative team. You truly do get to see that in Daredevil Volume 2 and it's a joy. I hope to see elements of this graphic novel in season 2 of the Netflix Daredevil show. I doubt we'll be seeing the Bullseye Elektra showdown but as much as a letdown as it was in the book I'd be just fine with that. If they follow Miller's lead when it comes to Punisher and Elektra it will be a stellar season. 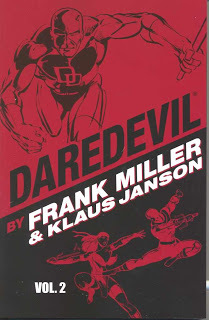 Enough about the show, this review is supposed to be about Daredevil by Frank Miller & Klaus Janson Volume 2. As I said in the Talking Nerdy Vlogcast #2, the DD Miller & Janson run should be read altogether, and therefore deserves its own omnibus collection. These stories flow so well together. You don't want to stop reading. The only time I stopped is when I needed to because it was so intense, emotional, gut and heart wrenching. I won't deny that the Electra Bullseye face off was a little underwhelming but it was more about the after effects than the fight itself and I know that if I would have read volume 1 immediately before this one I would have felt the heft of it since it had all of the Bullseye material and stories. This is the ultimate and essential collection of Daredevil comics right here. You'd be a fool to miss it. You don't need heightened senses or radar to know that this is some of the most excellent storytelling in Daredevil comics history. Daredevil Volume 2 by Frank Miller & Klaus Janson is a STRONG BUY. This is one classic that does stand the test of time.